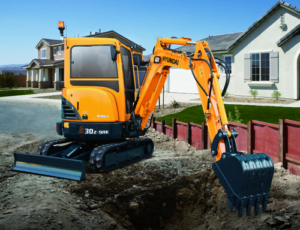 Hyundai Construction Equipment recently launched the HX130 LCR – the third compact-radius excavator model in the company’s HX series product line. 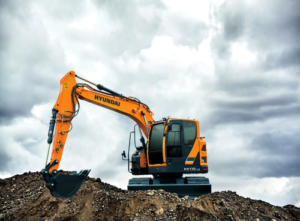 Visitors to the Hyundai stand at the forthcoming Hillhead exhibition (26th – 28th June, Buxton UK) will be amongst the first to see the machine at a UK exhibition. The new HX130 LCR excavator is powered by a 73.6 hp (55 kW) Perkins 854F Tier 4 final / Stage IIIB compliant diesel engine. When it comes to performance and productivity, the engine and hydraulic system of the HX130 LCR are hard to match. Its ‘Diesel Particulate Filter (DPF)’ equipped engine delivers optimum power and fuel efficiency, without the need for SCR. So, users do not have the hassle with AdBlue. As with all HX machines the HX130 LCR includes as standard an 8 inch (20.3 cm) interactive, adjustable, touchscreen cluster-monitor in the cab. Viewable on the cluster-monitor is the Hyundai-exclusive AAVM – or All-Around View Monitoring – an optional system that provides a 360°-surround virtual operating view. Included in AAVM is the IMOD (Intelligent Moving Object Detection) system that senses and warns the operator when objects come within 16.5 feet (5 m) of the machine. 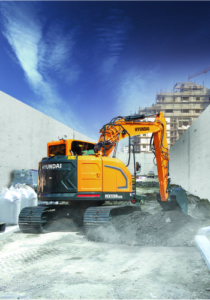 The AAVM system helps make the Hyundai HX series among the safest excavators to operate on any jobsite in the UK. The HL960 HD wheeled loader has an operating weight of 19,300 kg’s (42,549 Ib) and at the heart of the machine is a Stage IV Cummins QSB6.7 electronically controlled diesel engine with a net power of 222 hp (166 kW) at 2,200 rpm. The HL960 HD has been designed with a heavy-duty axle with enhanced load capacity for durability – the axles are the same as the larger HL970 machine. 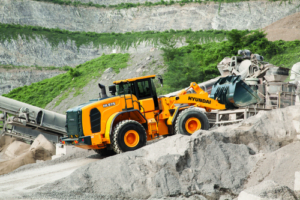 The maximum load capacity is 44,000kg at the front and 35,000kg at the rear which is considerably larger than the previous HL960 wheeled loader. The HL975 has an operating weight of 26,500kg and at the heart of the new machine is the very latest Cummins QSG12 engine (compliant to EU Stage IV emissions regulations) that delivers 250kW at 2,100 rev/min. With its high-strength design structure and durable system, proven by the rigorous tests at various work sites, the HL975, as with all Hyundai wheel loaders, has been designed to perform high-load work and maximize productivity. Durability of frames and attachments has been enhanced considerably compared with the previous generation 9-Series. As well as being more fuel-efficient, the HL Series of machines boast numerous environmental friendly features. For example, a programmable automatic engine shutdown feature prevents unnecessary fuel consumption and emissions by turning off the engine when it enters into a state of ‘idling’. There is also an optional five-speed transmission with a lock-up clutch, which improves efficiency. In addition, the Eco Gauge encourages economical operation by providing the operator with a visual reference of the machine’s fuel efficiency, total fuel consumption and average fuel data. The standard Eco Pedal automatically detects foot pressure and adjusts power modes according to job demand, while the ‘travel speed limit control’ feature limits the maximum speed within a 20-40km/h range to suit diverse working conditions, improving operational efficiency. The HX220 L has a 136kW Cummins QSB6.7 4-cycle turbocharged air cooled diesel engine, which complies with the latest emission standards Stage IV. 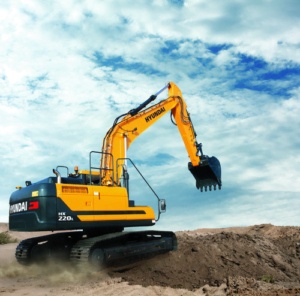 Hyundai claims a 90% reduction in nitrogen oxide for this 22t excavator compared to the 9A series of machines. The HX220 L is fitted with an ECO gauge which displays engine torque and fuel efficiency level. In addition, the gauge indicates the average fuel consumption and total amount of fuel consumed. The HX220 L can offer a reduction in fuel consumption of up to 12%, depending on application, compared to Hyundai’s 9A series of machines. The intelligent power control controls power depending on work environments. The mode can be selected, and pump flow can be controlled by a lever, reducing fuel consumption. 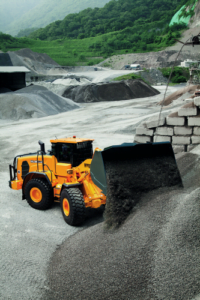 The HX Series provides higher productivity and the HX220 L can load trucks up to 5% faster than the 9A-Series. Part of the 3-4 tonne size class, the Hyundai R30Z-9AK is a 3.4t zero tail swing mini-excavator delivering powerful performance. The R30Z-9AK, which has a narrower stance, is ideal if you frequently have to work around width restrictions such as doors or gates. You can boost your digging performance with the long-arm option or a clamp. The fingertip-controlled boom offers the double benefit of improved controllability of the boom swing function, while also creating more floor space and comfort for the operator. The 2.88kg machine is targeted at contractors and tradesmen who need a reliable and productive machine, the R30Z-9AK rounds out Hyundai’s mini excavator range and is a compact, nimble machine that provides plenty of power to get the job done. The large dozer blade on the machine provides added versatility, work efficiency and stability for the job in hand. The new R30Z-9AK is powered by a reliable, fuel efficient, low noise Kubota D1305 engine which is rated at 18.1kW (24.97 HP) at 2,350 rpm. The Kubota D1305 engine is a compact multi-cylinder liquid cooled industrial diesel engine which complies with the latest EU emission regulations and requires no additional After Treatment Tools.